What age can my child commence with the Reading Programs? Age has little to do with readiness to learn to read. The most essential and reliable tool for placing any child in the educational process is testing. The ACE educational resources offer the Reading Readiness Test and the Coordination Development Tests to determine the reading program to suit the student. These tests determine a child’s maturity level and basic motor skills as well as academic preparedness. 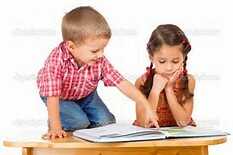 Children are are placed individually in the reading program best suited to them according to their maturity level rather than chronological level (age). If a child does not test ready to read, they will begin with the Kindergarten with Ace and Christi educational program. If a child demonstrates reading readiness then they will commence with the ABCs with Ace and Christi educational program. Vocabulary building is foundational, and reading is fundamental in the ACE educational program. Through proper diagnosis, the teaching of phonics, and reinforcement of vocabulary building, these educational resources gives a child a total reading program. Reading is fundamental to a childs ability to learn new information, and proficiency in this skill is foundational for all other subjects . Throughout the curriculum there is an emphasis on reading mastery. Mastering readingis one of the basic foundations of the individualised approach to learning. A child cannot progress with confidence unless they have mastered the material before them. That is why the initial learning of phonics is so important. Frustration with reading can be a thing of the past! You will be amazed at how quickly your child progresses as you supervise their reading program. The phonics program teaches them to sound out any word. Mastery gives every student the opportunity to be successful in their reading. Parent’s four volume daily self-instructional manual, covering 36 weeks and utilising all development skills. Student’s twelve PACEs, work books, in each of the five subjects (Math, English, Word Building, Science and Social Studies.) This provides practise in all developmental skills necessary for the learn-to-read program. Coordination and Development Tests and activities to evaluate physical coordination skills. Large Animal Sound Display Cards to correlate stories to letter sounds. Song CD to reinforce phonetic sounds and encourage motor coordiantion. Number Train Cards to emphasise number recognition. Progress Report, reporting your child’s progress. The above kit is a program designed to prepare the kindergarten student to be ready for the next step in the learning to read. This is known as the ABCs with Ace and Christi educational program. Parents two-volume instructional manual with detailed easy to follow plans for each day- total of 900 pages. Large and small Alphabet Sound Cards for display and review. Tactile cards, visual learning aids for your child. Song CD for reinforcement of sounds and songs. Progress Report, reporting your childs progress. A special Diploma for the completion of ABCs with Ace and Christi program. A Reading readiness Pre- test and Post-test to evaluate reading ability to progress in their learning program. The program promotes continuity of learning, leading the student to complete their Year 1 self-contained Instructional Unit program.